With such homophobia in hip-hop today it makes you wonder why any artist would post up on his mixtape cover with his shirt off?? Just thinking out loud.. 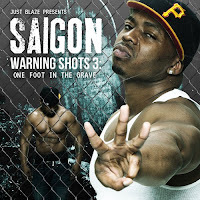 But the main issue is the music and Saigon comes correct with the third installment of Warning Shots. Watch for Joe Budden on track 6.